Lockheed Martin today delivered the first fully modernized C-5M Super Galaxy to the U.S. Air Force. The aircraft is the first of three developmental test C-5M aircraft to be delivered, with the other two to be delivered to Dover AFB, Del., in February 2009. Current Air Force plans call for Lockheed Martin to deliver 52 modernized C-5Ms. 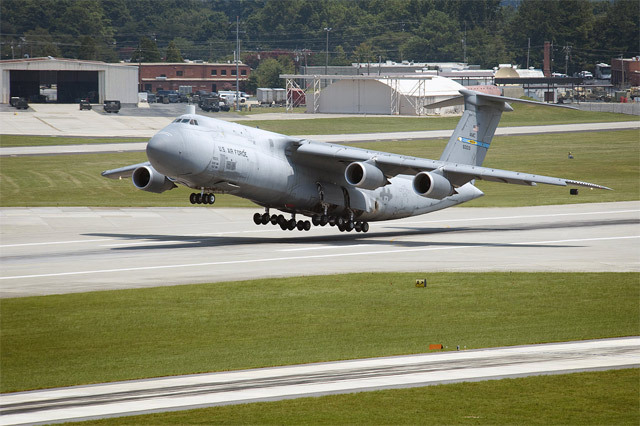 The C-5M Super Galaxy is the product of a two-phase modernization effort. The Avionics Modernization Program (AMP) provides a state-of-the-art glass cockpit and a digital backbone to support the Reliability Enhancement and Re-engining Program (RERP) modifications. 46 C-5 aircraft have completed the AMP modifications. The aircraft already returned to the fleet have logged more than 45,000 hours with the new systems, including many hours flown in support of Operation Iraqi Freedom. RERP is the second phase of the modernization effort, which adds new GE CF6-80C2 commercial engines (military designation F138-GE-100) and 70 other enhancements or replacements of major components and subsystems. The additional 10,000 lbs of thrust per propulsion system creates 40,000 lbs of additional thrust across the platform, significantly improving operational performance. This comprehensive modernization program improves the fleet mission-capable rate (aircraft availability) and the overall reliability and maintainability of the aircraft while reducing total ownership costs. The C-5 has been the backbone of strategic airlift in every engagement since it entered service. It is the only aircraft capable of carrying 100 percent of certified air-transportable cargo, with a dedicated passenger compartment enabling commanders to have troops and their equipment arrive in an area of operation simultaneously. The C-5 can carry twice the cargo of other strategic airlift systems. With more than 70 percent of its structural service life remaining, Lockheed Martin is committed to sustaining the C-5 fleet throughout its lifecycle. The C-5M Super Galaxy will continue to be a force enabler through 2040. 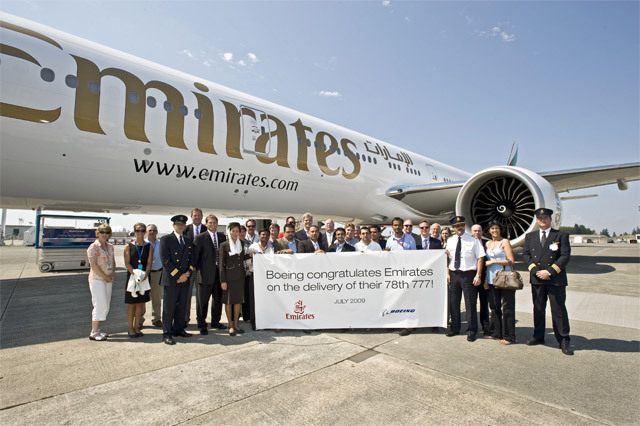 On Wednesday Boeing delivered Emirates’ 78th 777, the airline’s 45th 777-300ER (Extended Range). The Dubai-based carrier is now the world’s largest operator of the 777 and the only airline to operate every model type, with an additional nine 777-200s, 12 777-300s, 10 777-200LRs (Longer Range) and two 777 Freighters in its fleet. Emirates also has an additional 28 Boeing 777s on order. Emirates received its first Boeing 777 in 1996. The airline recently completed an upgrade program on all its 777s that equipped the airplanes with Emirates’ award-winning ICE (Information, Communication, Entertainment) system, offering passengers in every cabin up to 1,000 channels of on-demand entertainment. 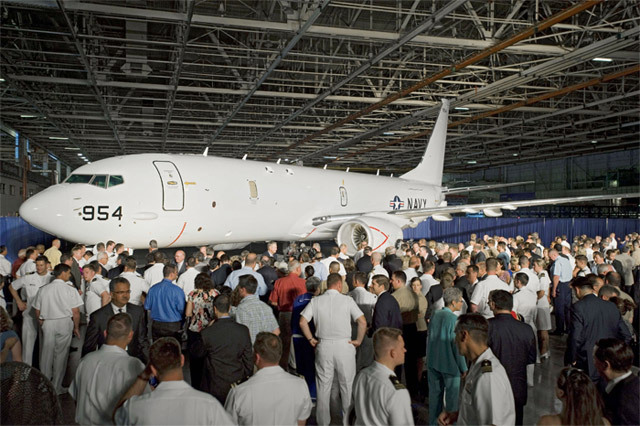 Boeing and the U.S. Navy on Thursday formally unveiled the newest maritime patrol and reconnaissance aircraft, the P-8A Poseidon. A derivative of the Next-Generation 737-800, the P-8A is a long-range anti-submarine warfare, anti-surface warfare, intelligence, surveillance and reconnaissance aircraft capable of broad-area, maritime and littoral operations. “The P-8A Poseidon will equip the U.S. Navy with the most advanced multi-mission maritime patrol and reconnaissance aircraft in the world,” said Jim Albaugh, president and CEO of Boeing Integrated Defense Systems. As the replacement for the Navy’s P-3C Orion aircraft, the P-8A will provide greater payload capacity, significant growth potential, unprecedented flexibility and interoperability, and advanced mission systems, software and communications. The P-8A is built by a Boeing-led industry team that includes CFM International, Northrop Grumman, Raytheon, Spirit AeroSystems and GE Aviation. The team currently is assembling and testing the first five P-8As as part of the program’s System Development and Demonstration contract, awarded in 2004. The integrated Navy/Boeing team will begin formal flight testing of the P-8A later this year. The Navy plans to purchase 117 P-8As, and initial operational capability is planned for 2013. Airbus on Thursday delivered the 1000th aircraft from the A330/A340 Family. 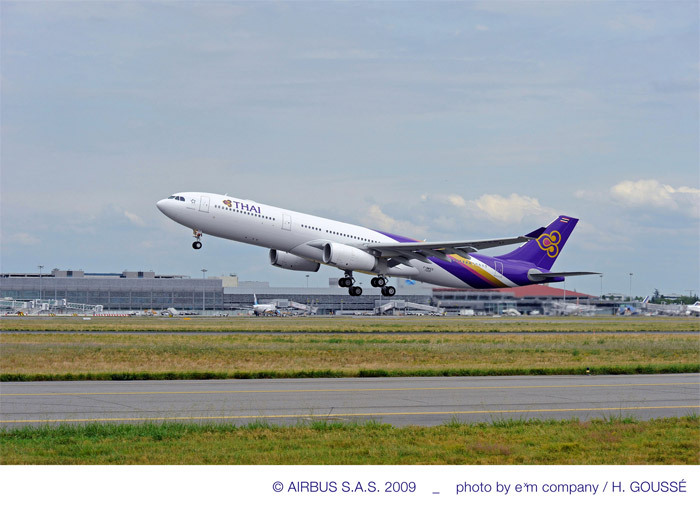 The aircraft, an A330-300, was handed over to Thai Airways International (THAI) at a special ceremony in Toulouse. With today’s delivery, THAI increases its in-service A330/A340 fleet to a total of 25 aircraft, comprising 15 A330-300s, four A340-500s and six A340-600s. The airline also operates a fleet of 17 A300-600Rs on its regional network. Since the first aircraft from the A330/A340 Family was delivered in 1993, the product line has become the most successful mid-size widebody programme ever, with 1,406 firm orders from 103 customers worldwide. Today, aircraft from the family are flying with 100 operators worldwide and the world fleet has accumulated more than 27 million flight hours in over 5 million revenue flights. The A330/A340 Family comprises the twin engine A330 for medium and long range operations and the four engine A340 for very long haul routes. A new freighter version of the A330 is currently under development and will enter service in 2010. Airbus today announced that Ethiopian Airlines has signed a Memorandum of Understanding (MoU) for 12 Airbus A350 XWB aircraft, becoming a new Airbus customer. The airline has selected the A350-900, and will operate the aircraft from their hub in Addis Ababa, linking Africa with Europe, the US and Asia. Firm orders for the A350 XWB now stand at 493 from 31 customers worldwide. 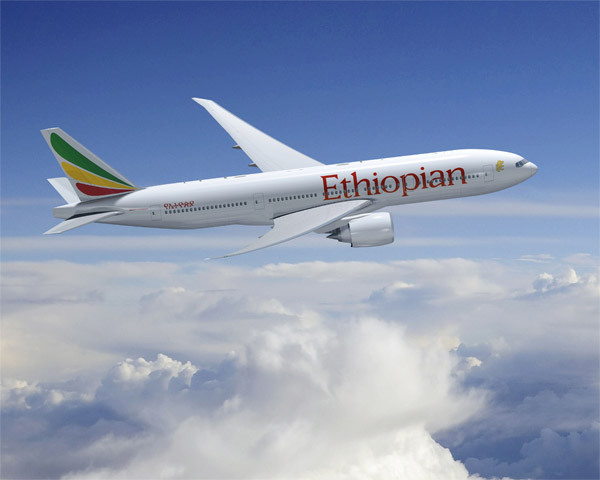 Boeing and Ethiopian Airlines today announced an order for five Boeing 777-200LRs. Ethiopian Airlines becomes the first African carrier to order and operate the ultra-long-range 777-200LR model. General Electric GE90-110 engines power the 777-200LR. Based in Addis Ababa, Ethiopia, the carrier is investing in the additional airplanes to expand its fleet and broaden its network. Ethiopian Airlines will use the 777-200LR to fly to new long-haul nonstop markets such as Washington, D.C. and Beijing. Ethiopian currently operates a fleet of six 737s, nine 757s, 10 767s and one MD-11BCF, with a second MD-11BCF due to arrive in August. It has 10 787s on order. Saudi Arabia has ordered three additional A330 Multi-Role Tanker Transport (MRTT) aircraft (on which the Northrop Grumman KC-45 Tanker is based). 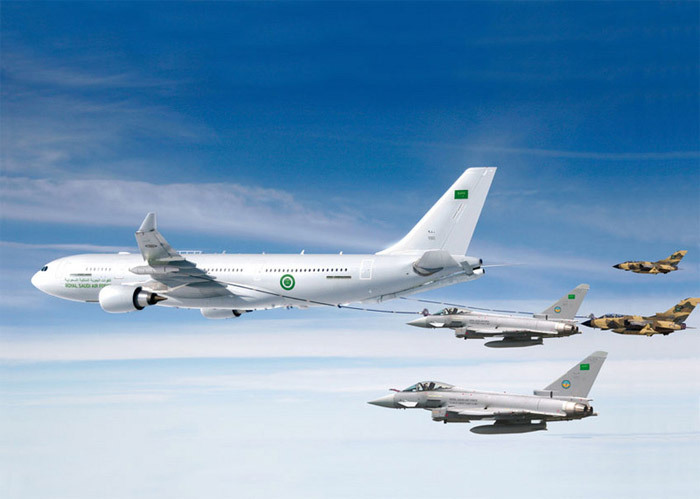 This second acquisition by the Saudi Ministry of Defense and Aviation brings to six the total A330 MRTTs ordered for the Royal Saudi Air Force, with delivery of the service’s first aircraft scheduled in 2011. The contract also includes an in-service support package. The Saudi Arabian A330 MRTTs will incorporate EADS’ next-generation fly-by-wire Advanced Refueling Boom System on the fuselage centerline, plus two all-digital Cobham 905E hose-and-drogue refueling pods under the wings. Aerial refueling operations are controlled from a state-of-the-art Remote Aerial Refueling Operator station in the cockpit behind the pilots, incorporating an enhanced vision system with laser infrared lighting and high-definition digital stereoscopic viewing. Airbus Military, an EADS company, is responsible for the design and production of the A330 Multi-Role Tanker Transport. In addition to Saudi Arabia, the air forces of Australia, the United Kingdom and the United Arab Emirates have chosen the A330 MRTT. Boeing and Turkish Airlines have finalized an order for seven Boeing 777-300ER (Extended Range) airplanes. This order is in addition to the five 777-300ERs that Turkish Airlines ordered in April 2009, bringing their total 777-300ER orders to 12. The airline currently operates a fleet of 65 Boeing airplanes including Next-Generation 737s and leased 777-300ERs. The airplane can seat up to 365 passengers in a three-class configuration and has a maximum range of 7,930 nautical miles (14,685 km). Turkish Airlines is one of the fastest growing airlines in the world. It carries approximately 20 million passengers a year, with direct flights to 108 international and 33 domestic destinations. The airline was founded in 1933 with a fleet of five airplanes that carried a total of 28 passengers. The airline made its first domestic flight in 1933 and the first international flight in 1947. This week Airbus announced deliveries of A320 Family aircraft to two Chinese airlines. Shanghai Airlines has taken delivery of its first Airbus aircraft, an A321 (B-6591), becoming a new operator of Airbus aircraft. The aircraft is the first of 10 A321s ordered by the Shanghai-based carrier in 2006 and 2007. Powered by IAE V2533-A5 engines, the carrier’s first A321 is fitted in an all-new, comfortable two-class configuration with 178 seats (166 seats in Economy, 12 in Business Class). The aircraft will initially be deployed on domestic routes followed in the future by regional routes including Japan and Korea. Shanghai Airlines was set up in 1985. Headquartered in Shanghai, the carrier now operates 68 aircraft on more than 170 domestic, regional and international passenger and freighter routes linking over 60 destinations across China and around the world. Shanghai Airlines is a member of the Star Alliance. Juneyao Airlines, a Shanghai-based privately-owned carrier, has taken delivery of its first purchased A320. Juneyao Airlines currently operates 10 leased Airbus aircraft – two A319s and eight A320s – with 10 more A320s, via operating lease and purchase, due to join the fleet by the end of 2012. The aircraft, the first of six ordered in June 2007, is powered by CFM56 engines and will accommodate 158 passengers in a two-class configuration, including eight first class seats. The airline plans to operate the A320 on routes between Shanghai and some of the most popular tourist destinations in China, as well as other destinations in Asia. 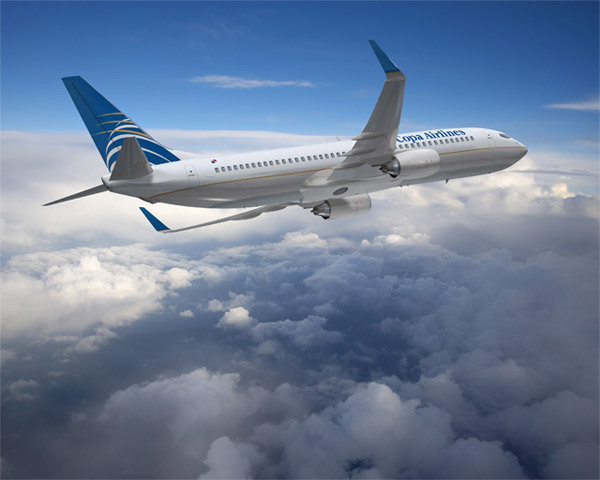 This week Boeing announced that Copa Airlines (Panama) placed an order for 13 Boeing 737-800 airplanes, plus options for an additional eight. The order represents a mixture of option conversions and new orders and brings the number of Boeing Next-Generation 737s the airline has on order to 27. The airplanes will be outfitted with Boeing’s signature Sky Interior. Drawing from years of research used to design the interior for the 787 Dreamliner, the 737 Boeing Sky Interior features new, 787-style sculpted sidewalls and window reveals that provide passengers with a greater connection to the flying experience. Copa operates from Tocumen International Airport, a time-saving hub on long routes between the United States, South and Central America, and the Caribbean. The airline flies four of the world’s longest 737 routes from there – to Buenos Aires, Santiago, Sao Paulo and Los Angeles.